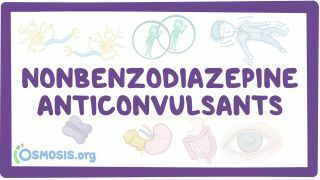 Osmosis: Nonbenzodiazepine anticonvulsants. (2019, April 20). Retrieved from (https://www.osmosis.org/learn/Nonbenzodiazepine_anticonvulsants). Topiramate (trade name Topamax) is an anticonvulsant (antiepilepsy) drug. Several cellular targets have been proposed to be relevant to the therapeutic activity of topiramate. These include (1) voltage-gated sodium channels; (2) high-voltage-activated calcium channels; (3) GABA-A receptors; (4) AMPA/kainate receptors; and (5) carbonic anhydrase isoenzymes. Gabapentin (trade name Neurontin) is a medication used to treat epilepsy, neuropathic pain, and hot flashes. It is recommended as a first line agent for the treatment of neuropathic pain arising from diabetic neuropathy, post-herpetic neuralgia, and central neuropathic pain. Valproate, also known valproic acid, is a medication primarily used to treat epilepsy and bipolar disorder and to prevent migraine headaches. It is useful for the prevention of seizures in those with absence seizures, partial seizures, and generalized seizures. It can be given intravenously or by mouth. Carbamazepine (trade name Tegretol) is a medication used primarily in the treatment of epilepsy and neuropathic pain. For seizures it works as well as phenytoin and valproate. It is not effective for absence seizures or myoclonic seizures. It may be used in schizophrenia along with other medications and as a second line agent in bipolar disorder. Phenytoin is an anti-seizure medication. It is useful for the prevention of tonic-clonic seizures, partial seizures, but not absence seizures. The intravenous form is used for status epilepticus that does not improve with benzodiazepines. It may also be used for certain heart arrhythmias or neuropathic pain. It is classified as a type IB anti-arrythmic medication. Lamotrigine, marketed in most of the world as Lamictal /ləˈmɪktəl/ by GlaxoSmithKline, is an anticonvulsant drug used in the treatment of epilepsy and bipolar disorder. It is also used off-label as an adjunct in treating clinical depression. For epilepsy, it is used to treat focal seizures, primary and secondary tonic-clonic seizures, and seizures associated with Lennox-Gastaut syndrome. Like many other anticonvulsant medications, lamotrigine also seems to act as an effective mood stabilizer, and has been the first US Food and Drug Administration (FDA)-approved drug for this purpose since lithium, a drug approved almost 30 years earlier. It is approved for the maintenance treatment of bipolar type I.
Ethosuximide is a succinimide anticonvulsant, used mainly in absence seizures. It affects neuronal excitability includes block of T-type calcium channels and is known to cause Stevens–Johnson syndrome. Levetiracetam, marketed under the trade name Keppra among others, is a medication used to treat epilepsy. It is used for partial onset, myoclonic, or tonic-clonic seizures. The exact mechanism by which levetiracetam acts to treat epilepsy is unknown. However, the drug binds to a synaptic vesicle glycoprotein, SV2A, and inhibits presynaptic calcium channels reducing neurotransmitter release and acting as a neuromodulator. This is believed to impede impulse conduction across synapses. Vigabatrin (trade name Sabril), also known as gamma-vinyl-GABA, is an antiepileptic drug that inhibits the breakdown of γ-aminobutyric acid (GABA) by acting as a suicide inhibitor of GABA transaminase (GABA-T). It is a structural analog of GABA, but does not bind to GABA receptors. Tiagabine (brand name Gabitril) is an anticonvulsive medication. The medication is also used in the treatment of panic disorder, as are a few other anticonvulsants. What is the MOA of the anti-epileptic Vigabatrin? A 21-year old G1P0 woman is diagnosed with bipolar disorder and is hospitalized for an acute manic episode that has now resolved. You are asked to design a pharmacologic treatment plan for her, knowing that she is in the second trimester of pregnancy. Which of the following is the best pharmacological option for treatment?